Steelcraft mini Glimpses have arrived!!! Discussion in 'Todd Begg Knives' started by Nephilim Killer, Feb 26, 2018. I, for one, would like to see a pic or two of this knife in hand. It looks too small for 4 finger grip and that forward choil looks to narrow for safe finger grip. That is all keeping me from picking one up. I have large hands but carry small flippers 90% of the time. The Mini Glimpse is a comfortable hold. The blade choil is best used for pull cuts because if you push forward you could cut yourself. Awesome. Perfect pic. Thx. Gonna look for one now. Yeah, I figured that choil was too shallow. Shame they did not make it wee bit bigger. This knife is designed for small hands. This knife fits fine with the hand size it is meant for. Some designers make minis for larger hands but we make minis and want to keep the lines. If we were to make a mini for larger hands the lines would need to accommodate the smaller size. Make sense. No problem with that at all. Decided to pass cuz a tad too small. And the full is too big. Maybe the right one will land someday. Beautiful knives regardless. The good news is we have a nw model coming out in our Steelcraft line that is a 3.25 inch blade which might be perfect for your hands. I understand size isn't a determining factor, but $400 for the Mini and $350 for the full-size version? Why the price differential? Disregard - I see why: Reate produced the Mini, while WE produced the full-size Glimpse. The Reate-produced Mini also has Titanium handles with inset CF, while the WE full-size Glimpse uses G-10 and CF. All things considered, I can understand the price increase. My Steelcraft Mini Glimpse is a beauty that's super smooth. It weighs 3.68 ounces with a 2.973” blade length and 0.144" blade thickness. The CF inlay on the Mini Glimpse is seamless and adds decent traction. Mini Glimpse is $399 vs. $445 for Mini Bodega. Mini Glimpse is more comfortable in the hand because it doesn't have that raised clip of the Mini Bodega. I find the Mini Glimpse better for EDC due to blade shape, smooth surface and comfortable hold. The Steelcraft Mini Bodega and Mini Glimpse are my two most favorite small folders. Thank you for the mini review! I went ahead and picked one up and I have to say it is a very nice little knife. Size wise it is about as big as a Rat 2 just a tad bigger. I love the blade shape and that was one of the main reasons I wanted the Glimpse or mini glimpse. It almost reminds me of the insingo on a Chris reeves knife. Reate has an amazing fit and finish as always, perfect Carbon Fiber inlay and the action is super smooth and getting smoother as it breaks in. the only issue I have with it is the blade did not come very sharp. Which isn't a big deal although at the $400 price range I would want a shaving sharp blade. I have sharpened s35vn before and in my experience it sharpens to an incredible shaving sharp edge. But for some reason I cannot get this little guy sharp. I can get a utility edge on it but for a small knife like the glimpse I really want a sharp slicey edge. I Compared the blade stock and grind to the ADV beast knife I have and the glimpse is about as thick behind the edge, so there is no reason it shouldn't take a keen edge to it. Any thoughts on this? Have you sharpened yours and if so how well did it sharpen up? I really do not want to spend more money to send it in to be professionally sharpened but I might have to. ...the only issue I have with it is the blade did not come very sharp. Which isn't a big deal although at the $400 price range I would want a shaving sharp blade. I really do not want to spend more money to send it in to be professionally sharpened but I might have to. Nor should you have to at this price point. That's disappointing to hear and should not be the case. So I will give it this week and see if it gets any worse. I just picked one of these up, in the blue anodized Ti frame, and it is beautiful. 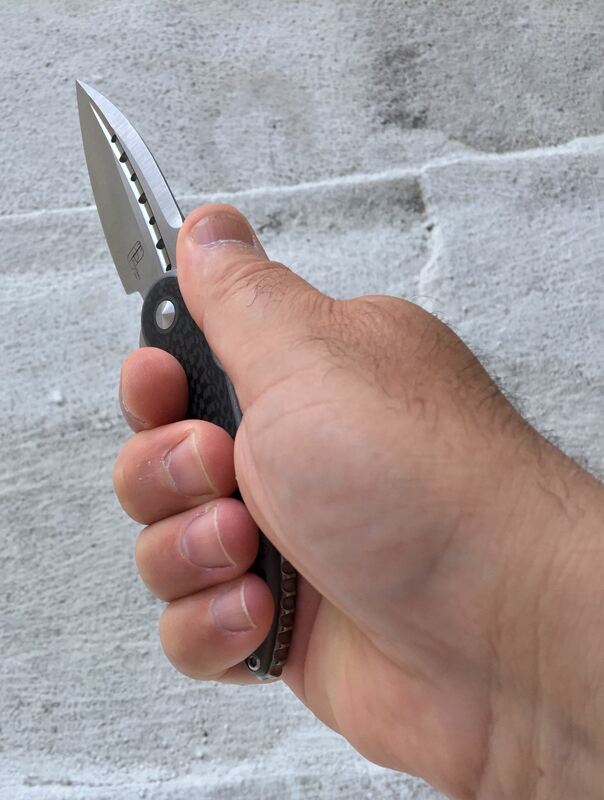 Finger choil is more than usable for me, and it's a very comfortable knife to hold, particularly because of the rounded "bottom" (end the screws into the scale) of the clip. Incredibly smooth deployment, and the detent and flipper tab are really well done. My only question is the lock bar; it is carbidized rather than using a steel insert, as noted earlier. Lock-up is about 20%, and I was interested in hearing if others have had experience with premature lock-face wear on Reate-built knives without a lock-bar insert. As a knife that will get flipped a lot, I'm a little baffled why Begg/Reate didn't include this one feature in an otherwise incredibly well-designed knife. Many thanks in advance. I have had mine for a few months now. I really like it. I have small hands and it sits perfect in my grip. I can see where someone with large hands might have a problem. But that applies to all small knives. I have the Mini Glimpse and absolutely love it. I am however considering stonewashing the blade. Problem is, I cannot get the pivot screw to come out. It turns but doesn't loosen/come out. I sent a note to customer service a bout a week ago but haven't received any response. Any thougts? It may be a free spinning pivot. Try applying pressure on the other side with your thumb, or something that'll grip and stick to the pivot while you try to loosen the screw. David uses a glue not a lock tight if you put it into boiling water the glue will come loose. We have asked him to use lock tight but this is what we get. If you ever have problems you can send the knife to us. After boiling for a few minutes then the glue will loosen up and then take a towel or cloth and fold it and place the blade edge down into the cloth with some pressure so the pivot binds then the pivot screw should come loose no problem if you have any more trouble then boil it longer. After getting it out then clean the pivot screw and add a normal amount of lock tight. I hope this helps. I know this trick because Phil Boguzuski would glue his pivots to stop people from taking his knives apart and when they sent their knife into him he would boil them to loosen the pivot. He explained this to my brother Todd a long time ago. 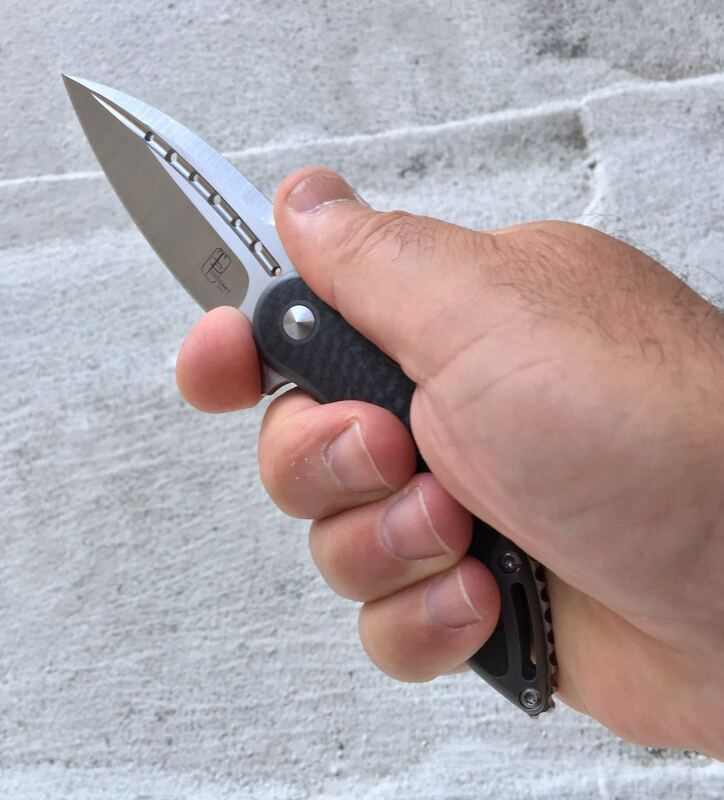 Has anyone picked up the G10 version of the Steelcraft Mini Glimpse? I see there are a couple on BHQ but I can't find any elsewhere. There seems to be a friction folder variant as well? Can anyone tell me if they have put their hands on the G10 version and whether it has the same titanium interface lock as the normal variant with titanium handles? Obviously the titanium handle version is a frame lock, while the G10 version would be a liner lock.